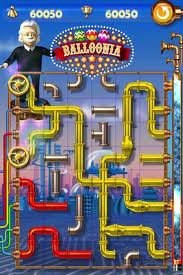 My kids have tried this pipe strategy game Balloonia from Canadian game developer JVL MOBI and liked it. Pipe strategy games have a long pedigree in hand-helds and Balloonia is among the first to have ported it nicely to the Iphone/Ipod platform. I had never heard of JVL MOBI before, and recalling a similar pipe strategy game on the Palm V (which kept me company for several years in the 90s), I was spurred to write their spokesperson Brian Williams with a request for an email interview. Tell us about JVL Mobi. JVL Corporation was founded more than 25 years ago. What began as a small, coin-operated machine repair service quickly grew into a fully integrated engineering company – conceptualizing, developing, and manufacturing a wide range of multi-media consumer products (amusement, music, gaming, and most recently, mobile applications). We created JVL Mobi in 2008 in order to enter the game app market and have thus far achieved upwards of 3 million downloads on Apple’s iTunes store. JVL MOBI is based out Toronto, Canada. How long has your team/company established itself and how did it happen? JVL MOBI is now 3 years old. However, JVL Amusement has been developing and publishing games for years. With 150 titles and counting, we have among the largest inventory of casual games out there, many of which have been rendered in HD. So, it was a logical next step to begin converting our games for use on a portable device. We have released 11 games to date, and will continue to port our other titles to mobile platforms. Can you tell my readers how your game/app was inspired? Given that there has been a long history of pipe strategy games going back all the way to the Palm OS, how did you set about to differentiate your app? We’re all big fans of strategy games, here at JVL MOBI, and needless to say “pipe-type” strategy games. When discussions commenced about creating our version of such a game, our design team took creative license and envisioned a Salvador Dali-like world where a mad scientist ruled all; his environment ordained by imagination to no limit. It is in his whimsical production factory, that he plays conductor, orchestrating and controlling the manufacturing of each element of pipe. With a few key flicks of the organe de couleur, he guides the multi-colored tubes through their many twists and turns, creating perfectly linked pipelines to the hot air balloons of tranquility. How long did it take to plan, develop and program the game/app? We put in a lot of effort in the conceptualization and development of all of our games, and although our turn-around time is impressive – our designers will always make the necessary effort to incorporate unique, interesting nuances to make JVL games fun, and keep players engaged. We feel players want games that are enjoyable to play, will keep them interested over time, and are both nice to look at and listen to. We strive to provide that in each of our offerings. So, it is never a rushed process, and like fine wine, the more time invested in refinement, the better the wine in the glass. What other apps and projects has your team/company undertaken recently? What are your plans for your next app? Are there any interesting news that we can watch out for in the next 6 months? We will continue to adapt games that have seen success in countertop amusement play to a variety of hand-held gaming platforms. Our hugely popular “What’s The Difference?” app will soon grow to offer players the same, great game-play experience, but with additional versions, and new, exciting themes to be enjoyed alone, or among friends and family. Recently we have also launched a new social media marketing strategy and in-app advertising campaign with the intent of positioning JVL MOBI as a top game app producer and to help build a community of loyal gamers.